Wednesday 23 August 2018, Monterey, California – Jaguar has set a production EV record lap time of 1:48.18 at WeatherTech Raceway Laguna Seca in the new all-electric I-PACE performance SUV ahead of its display at the 2018 Rolex Monterey Motorsports Reunion and the Pebble Beach Concours d'Elegance. 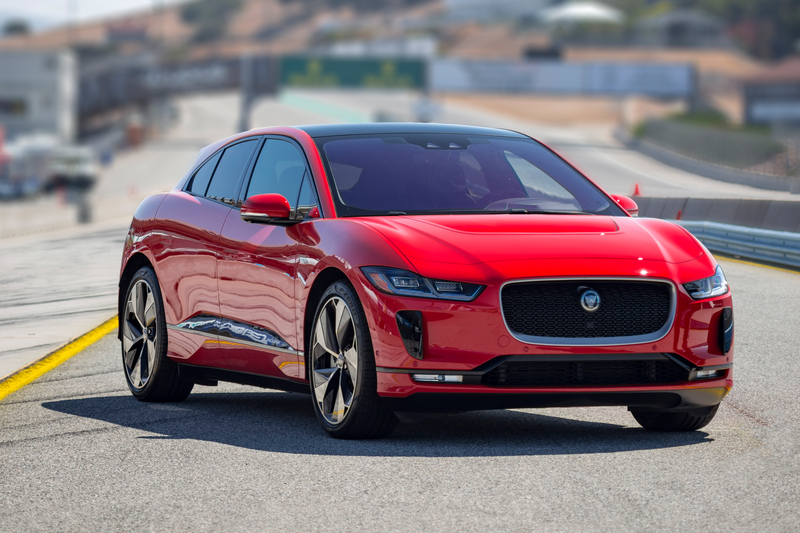 Piloted by professional race car driver Randy Pobst, the Photon Red 2019 Jaguar I-PACE HSE First Edition tackled the 11-turn with no modifications whatsoever. Pobst set what Motor Trend believes is the benchmark for the fastest lap at WeatherTech Raceway Laguna Seca for a four-door stock production electric vehicle. Footage of Pobst's lap is available online here. More video will be available from 7 September on theMotor Trend App andMotor Trend YouTube channel. Priced from $119,000 (+ ORCs) and featuring all-wheel drive as standard, the I-PACE is available in three trim levels: S, SE and HSE – with an additional First Edition model available for the first year only. After becoming the first premium manufacturer to enter the ABB FIA Formula E Championship in 2016 with its I-TYPE 1 open wheel racecar, Jaguar announced the creation of the world's first production battery electric vehicle race series – the Jaguar I-PACE eTROPHY Championship. The championship supports the launch of the I-PACE and reinforces Jaguar Land Rover's commitment to electrification: from 2020 all new model lines will be electrified, with either battery electric, plug-in hybrid or mild hybrid options. Veteran sports car and open-wheel racing driver Katherine Legge was confirmed as the team's first Jaguar I-PACE eTROPHY pilot during the final rounds of the 2017/18 Formula E Championship held in New York City in July. A native of the UK, Legge currently competes in the IMSA GTD class; her resume includes experience in Formula 3, Formula Renault, a Formula One test, Champ Car, Indy car, A1GP, DTM, and the first season of the Formula E championship. Additional information on Legge's announcement with RLL can be found here. Earlier this week it was announced that Legge would be joined by Bryan Sellers in RLL's second car. American sports car racer Bryan Sellers also currently competes in IMSA, behind the wheel of a Lamborghini Huracán GT3. Sellers' resume includes drives in the American Le Mans Series, Rolex Sports Car, Skip Barber Formula Dodge and winning the USF2000 National Championship in 2002. Additional information on Sellers' announcement with RLL can be found here. Guests to both the 2018 Rolex Monterey Motorsports Reunion and the 2018 Pebble Beach Concours d'Elegance will be among the first to see the Jaguar I-PACE eTROPHY racecar in person. Finished in RLL race livery, the racecar will be displayed Friday and Saturday at the Jaguar pit garages at WeatherTech Raceway Laguna Seca, and Sunday on the Concept Lawn of the Pebble Beach Concours d'Elegance. Jaguar's heritage of elegant design and breath-taking performance has excited and delighted the world for 80 years. Today's world-class Jaguar family embodies the Art of Performance, with the remarkable, much admired and award-winning XE, XF and XJ saloons, the dramatic F-TYPE sports car, the F-PACE performance crossover – the fastest-selling Jaguar ever, the new E-PACE compact performance SUV and now I-PACE, the all-electric performance SUV that puts Jaguar at the forefront of the electric vehicle revolution. Jaguar returned to racing in October 2016, becoming the first premium manufacturer to join the all-electric ABB FIA Formula E Championship Street racing series. Jaguar's Formula E programme will create tangible R&D benefits for the electrification of future Jaguar and Land Rover road cars. Jaguar has now created the world's first production battery electric vehicle race series, the Jaguar I-PACE eTROPHY, which will be the official support series for the ABB FIA Formula E Championship, starting in Season Five. The series supports the launch of the Jaguar I-PACE, Jaguar's first battery electric vehicle, and reinforces Jaguar Land Rover's future electrification strategy, commitment to electric street racing and 'Race to Innovate' mission. Piloted by professional racing driver Randy Pobst, the new Jaguar I-PACE HSE First Edition lapped the 11-turn road course in 1:48.18.